It is impossible to know everything, but knowing a little bit about everything will give you the upper hand in the worst-case scenario. When living in a home where roof is exposed to severe weather from time to time, it is good to understand some basic roof repairs. When a storm has caused some damage to your roof, and it is not possible to get a roofer to your house asap, then you can take some action to minimize the damage. Here are some roof repairing steps that will help you fix the problem or at least prevent more destruction from occurring. Water stains on the ceiling or water running down your wall is a dreaded sight to any homeowner. It is a sign that your roof is damaged and not keeping the water out like it is designed to do. However, finding where the leak is coming from is not as easy because the leakage is not necessarily directly above the water stain. The first place to check is the outside of your roof to see if there is an unwanted entrance. Penetration to the roof can come from plumbing, roof vents, chimneys, dormers and more. The damage area is not always situated close by the leak or on either side of the leakage. If you struggle to find the area where the leakage is coming from then, you can recreate the leakage situation yourself with the help of a friend and your garden hose. Soak separate sections on your roof where the leakage seems to appear inside the house. Start by the lowest areas first, closet to the spot that is leaking. Make sure to wet each sector on the roof for at least several minutes before moving further up. Your friend should be keeping an eye on the inside of your home notifying you when the drip starts. The area where the drip starts can be considered the neighborhood of the leak, and now you can start to remove some shingles in this sector. 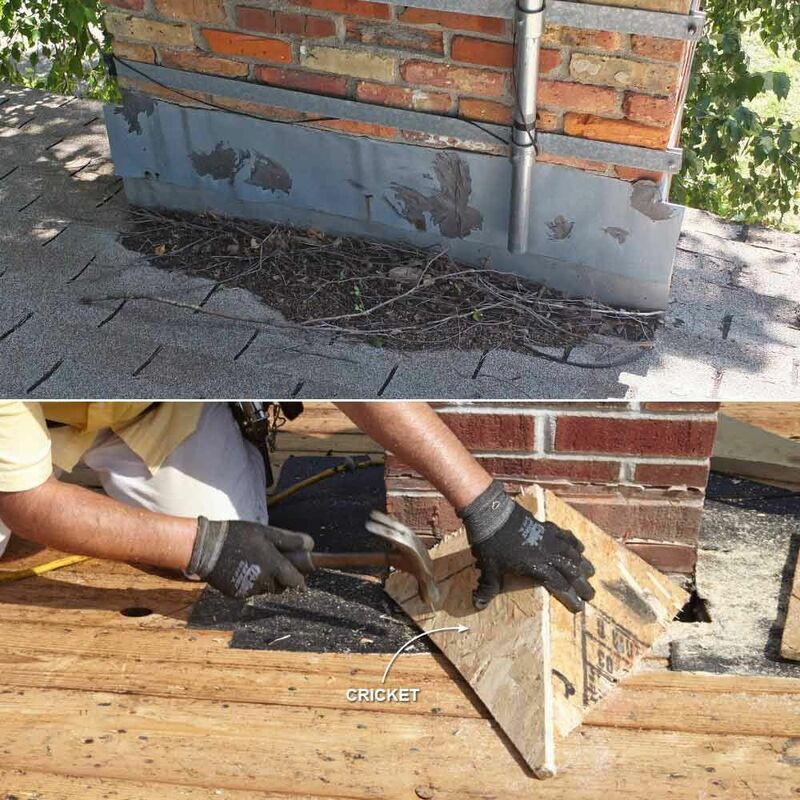 With the shingles taken off, you will quickly find where the leak is coming from because water stains and even rotten wood will appear where it is leaking in. In some cases, it is just a missing nail at the base of the plumbing vent boot that is allowing water to get in. It is better to replace the older nails with rubber-washered screws that are used for metal roofing systems. The shingles on the sides of the vents should be removed carefully and then with the help of a flat bar you can pop out the older nails. When the-the base is cracked, or seams are broken, and where the rubber boot around the pipes are rotting away, it is better to replace the old vent boots. Replace roof vents that are cracked or broken as caulk is only a temporary solution. Caulk can, however, be used on the sides of the vents underneath the shingles to create a water barrier. 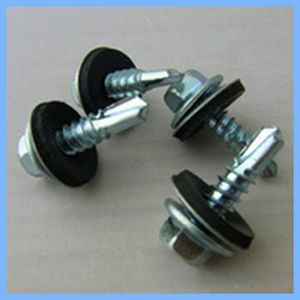 Nails that are pulled out or missing can also be replaced with rubber-washered screws. When a water dam forms of your roof due to a snowy border or debris it can cause leakage if the flashing of the roof is not sufficient. The water gets through an opening of the roof. By adding an ice and water barrier under the main roof joint, you can make sure the area is waterproof. The shingles should be removed until you reach the wood sheathing. Here you should overlap the water barrier which is adhesive below all the way down to the edge of the roof. While relaying the shingles, a metal step flashing can be slid behind the gutter trim. Having a good attic insulation and ventilation can also assist during those snowy days to keep the ice off the roof. A better option is to install heating cables that will melt the ice as soon as ice hits the roof, keeping those water dams away. The walls that intersect the roof have step flashing. Leakage can occur when water runs behind this flashing if the flashing gets rusted through or when a piece comes loose. A rusted flashing needs replacement and flashing should be checked to make sure that it is nailed down properly so that it does not slide down to expose the wall. Leaks around a brick chimney can happen due to many reasons, rusted flashing around the chimney is one of them. If it is not possible to install new flashing right away, you can just slide new flashing under the old rusted one. The water will be going in another direction, and the leakage will stop. Small holes in shingles might be the reason for water stains on your ceiling. These holes may be easy to fix, but they can cause a lot of damage like rot for example due to water leaking over an extended period before it even gets noticed. If you recently remove a satellite dish or unmounted an antenna, make sure to check and see if there were not any holes left over. Caulk can be used as a quick fix to stop the leakage, but eventually flashing should be used to repair the problem. A quick fix is not perfect, and they should not be the final solution. However, knowing how to apply a temporary repair can help prevent secondary damage. Keep in mind to always pay attention to safety first and where there are electrics integrated into the problem an expert advice should be sought first.